The Beatles 50 Years Ago Today: March 14, 1968. Beatles Radio: The Beatles, Solos, Covers, Birthdays, News The Fab 4 and More! 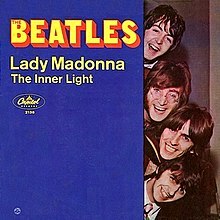 A promotional film for Lady Madonna is broadcast in black and white on UK television, on the BBC1 program "Top of the Pops." The video portion of the film clip was shot while The Beatles were performing the song Hey Bulldog, but the Lady Madonna audio track was paired with the video for the promo release. It won't be until 1999 that the video is broadcast with its original Hey Bulldog soundtrack.